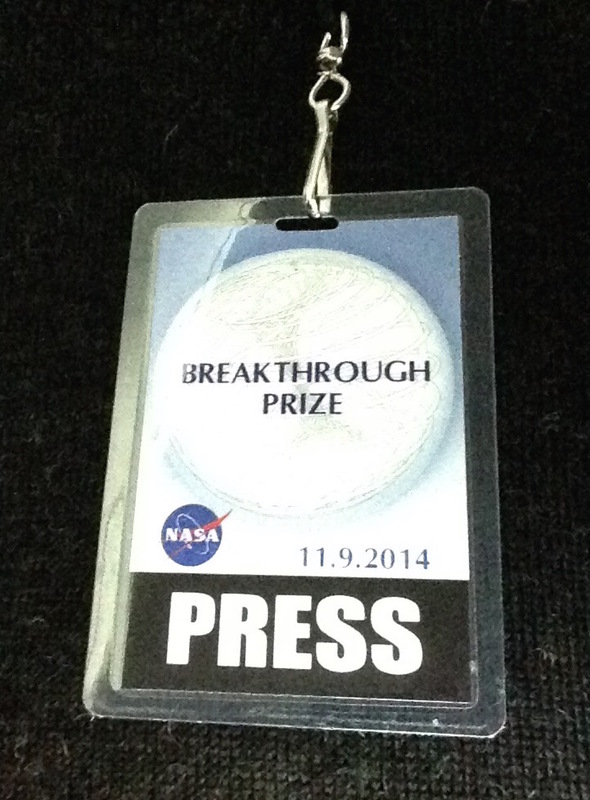 That’s the Press Badge I wore while covering last year’s Breakthrough Prize ceremony. You can get a sense of what the press berths looked like and what the paparazzi sounded like last year by watching this year’s National Geographic coverage (at 00:35 and probably many other places as well). For readers of this blog, the big news from Mountain View this year is, of course, Peter Scholze’s refusal of the $100,000 New Horizons Prize. That comes as a bit of a surprise to me, I have to admit; I was one of many, I’m sure, to have nominated Scholze for this prize, having heard reports from several sources that he was already at some risk of being nominated for the $3 million prize as well. The practical implications of nominating anyone for any one of these prizes amount to collecting three nomination letters (in my case, from the second, third, and fourth people of whom you, the reader, are presently thinking, the first being ineligible to write a letter on technical grounds) and then spending an unnecessarily long interval filling in the online nomination form, which does not allow you to save your work but requires everything to be entered at the same time. The ethical implications are rather more long-lasting, and you may want to bear this in mind when you read the following paragraphs. Anyone who has spent any time talking to Peter Scholze and listening attentively can tell you that his insightfulness is by no means limited to mathematical matters. In deciding to refuse the prize, he was therefore undoubtedly fully aware that he was also almost certainly irreversibly refusing the $3 million Breakthrough Prize that was very likely to be offered in the near future, as well as any similarly remunerative prizes inspired by the same logic. I would go so far as to speculate that, although he is as modest as anyone in his situation can possibly be, he was no less aware that, by refusing the prize, he was also depriving the prize of at least some of its luster and legitimacy — and doing so much more effectively than Grigori Perelman did when he refused the Fields Medal (because, let’s face it, however coherent Perelman’s reasoning may have been — see p. 160 of MWA for Thurston’s appreciation of Perelman’s coherence — Perelman’s eccentricity is impossible to disguise and makes him unlikely to be adopted as a role model). There are enough people out there with little regard for what university faculty do (witness the fact that a legislator in North Carolina actually proposed a bill that would require faculty in the UNC system, regardless of research expectations, to teach eight classes a year); the last thing we need is to provoke more hostility by suggesting that mathematicians are in the habit of daring the reader to try to understand their enlightened prose. That’s terribly wrong-headed in more ways than I can count — I have promised myself that I will eventually get around to enumerating some of them on this site — but Hunacek is undoubtedly right that pure mathematics faces a real challenge in making the case that its preservation is in the general interest of the broader society. Isn’t it a relief, then, to know that a caste of enlightened billionaires, unencumbered by the need to respond to what passes for the democratic process, is willing to hand over the keys to a few of its strongboxes to a handful of legitimately charismatic (or charismatically legitimate) representatives of the vocation, with no questions asked? But… It’s not only that our practice can rely on the generosity of the billionaires and (merely) multi-millionaires only as long as it is consistent with their business plan, meanwhile letting our legitimately elected representatives off the hook — and not only in the USA. It’s not only that Michael Jordan will be acknowledged to be the greatest basketball player of all time until such time as someone comes along who is acknowledged to be even greater, but that his name will forever be yoked to that of Nike, for better and also for worse. And it’s not only that, as I tried to make apparent in my slate.com article, whatever the Silicon Valley celebrities may think, the deep motivations that make someone want to be a mathematician are hopelessly, comically, incompatible with the deep motivations that make someone want to be a rock star — even (especially?) someone like Peter Scholze who actually has played in a rock band. It’s also — and for me this is the main point — that even when the billionaires and (merely) multi-millionaires use their influence and power in the pursuit of the public good — especially then — their generosity is still the vehicle of a vision no less antithetical to democracy than that of the feudal Dukes of Mark Kisin’s remark. However heartfelt and sincere their generosity, anyone who accepts it is inevitably entwined in this vision. It’s not impossible to take the steps necessary to get unentwined, but it’s also easier not to have to figure out what they are. Fortunately — and I am reaching for my Geiger counter as I write this, hoping I won’t need it — the vision of the Silicon Valley billionaires behind the Breakthrough Prizes is hardly above reproach. My slate.com piece reminded the readers of “the business model of Google and Facebook and the rest” that “hinges on turning our personalities into merchandise,” even when it does not facilitate the kind of government surveillance revealed by Edward Snowden. I have not yet read this book about the sharing economy but I’m pretty sure I’m in agreement with its main conclusions. Not that I’m completely innocent myself: on occasion I have written a positive review on some website or other when I was asked to do so and I felt the person who made the request deserved a boost; I did nominate Scholze for the prize he refused. And I’m grateful to the people I know, and the (very surprising) group of people I don’t know at all, who have reviewed my book on Amazon and “liked” the book’s Facebook page; but I’ll never write an Amazon review, I don’t and don’t intend to have a Facebook page in my own name, and even in the guise of mathematicswithoutapologies I see no reason to “like” anything unless it’s the only way to obtain vitally necessary information. And although I wish the winners well, I’m never going to nominate anyone for the $3 million prize. The sharing economy is about donating one’s time and energy gratis, to perform work which once allowed a person with recognized expertise to make a decent living, all for the benefit of Silicon Valley billionaires. I may be a fool, but I’m not a sucker. This entry was posted in Ethics, External goods, In the media on November 9, 2015 by mathematicswithoutapologies. Are you sure it’s true in all cases? Even for Cédric Villani for instance? Except in the cases of Cédric Villani, Dan Snaith, and Isidore Isou. schade, daß ein sehr interessanter aspekt an diesem medienspektakel hier nicht erwähnt wird (auch wenn es seine logik hat, daß es medienkritik schwer hat, es in die medien zu schaffen): der mathematiker Peter Scholze hat den ihm zugedachten “new horizons”-preis (immerhin 100.000 dollar) nicht angenommen, offenbar weil ihm diese art und weise des reputationsgewinns zuwider ist. man fühlt sich an Perelman erinnert (mehr was den Millenium prize als was die Fields-medaille angeht). i think what Scholze implied by declining the prize was something rather simple, i.e. a) he is not a junior researcher (unless the prize committee equates the word “junior” with “under 30 yrs old”. b) there are plenty of less-established and talented junior researchers (in the true meaning of the word) that need financial support. Scholze is gracious enough not to be a “prize hoarder”, and one can only praise him for that. Pingback: joaorico comments on "The Oracle of Arithmetic"